Truman (Jim Carrey) lives an idyllic life, not knowing that it is all an elaborate illusion. In reality he was adopted by the OmniCam Corporation and televisionary/producer (Ed Harris) who has filmed every moment of Truman's life. Finally, Truman begins to realise that his world is filled unexplained phenomena and his adventure really begins. Who would have thought that two of this decade's most fascinating film concepts have come from the same writer? And that this writer, who uses his craft as if he has worked with it for decades, has only these two films under his belt. Andrew Niccol wrote and directed 1997's Gattaca, a scorching and nearly perfect science fiction film that seems to be becoming science fact. The Truman Show is equally interesting, but not as complete or well crafted. But it's still an excellent film, and piles better than most mainstream counterparts. In fact, the only thing that Truman is missing is firm direction from its own mastermind. Not that Australian Peter Weir doesn't do a good job, though. The man who directed such films as Witness and Gallipoli certainly has much talent to offer; but Niccol seems eccentric and intelligent enough to give a greater flair to his material. In that way, The Truman Show is a little disappointing, but shows no faults that can't be overlooked, and gives no moments that can't be enjoyed. Truman Burbank (Jim Carrey) is the star of his own twenty-four hour documentary-soap opera. It's the longest and most popular television show in history, shot in the world's largest studio, one of only two man-made structures visible from space. You see, Truman is unaware of the thousands of cameras around him, filming every action and every word in his life. Ed Harris plays Christof, the show's creator, who is partly a god, a director and a father. The women in Truman's life are his wife Meryl (Laura Linney) and Sylvia (Natascha McElhone) - who Truman has always considered as the one who got away, as she was forced to depart the set after attempting to tell Truman that everything around him was fake. Marlon (Noah Emmerich) is his best mate, whose answers to life's problems are found in a six pack. It would be hard for any director, Niccol or no Niccol, to hide the fairly significant flaws in the plot fabric - especially since everything is crammed into a neat little 100-minute package. The story board of The Truman Show is just about as demanding as they get, with turns and developments at every corner, and the fact that it is a show within a world far too obsessed with mass media hysteria automatically adds another dimension to the film. Christof is easily the most intriguing character; a man who treats Truman with all the care and love of a father but does nothing that would strip him of a good camera angle. When Marlon tells Truman that he "would never lie" to him, the irony of the moment is given upon Christof's order to fade the television music out. The whole world is watching while two best mates express their emotions. Ed Harris gives Christof a real kick and an impeccable performance, marred only by a few lines of silly dialogue towards the end, when he tries to persuade those around him that Truman would be happier inside his comfortable nest rather than in the real world. As Internet reviewer Bryan Frazer stated, "for Truman, the real media-induced nightmare is outside of the bubble, not inside." It will come as a relief for many to know that, for the first time in history, Jim Carrey doesn't play the over-actor. Carrey gives a carefully subdued performance, allowing him to express his characters actions with eccentricity but not over-acting, and there's a major difference between the two. The over-actor of the film is Laura Linney, who gives a google-eyed over impersonation of a cheesy sitcom character, and ends up looking out of place and faintly idiotic. Not surprisingly, The Truman Show ends with a happy conclusion. It's not a complete one, though, since many characters seem to fade out of existence. This is perhaps Andrew Nicoll's only error in his screenplay, as his carefully placed characterizations of the show's actors seem to vanish into television fuzz. But it's really Truman's piece, and as he concludes his soul-searching journey, one can't help but be emotionally attached to this wonderfully complex yet distinctly humane character. More than anything else, Weir seems determined to make his thoughts about the irony of world's media clear. 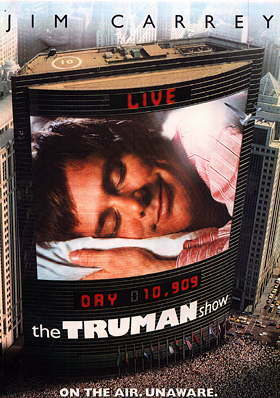 As the final moments draw to a close, we realize that there will always be an audience for the next Truman Show, and that the people who cheered for his freedom are the same who supported the show over its many years. For this fetching notion to be any more intriguing, inventive or prosperous, it would have taken its own mastermind to direct it.